All about the order process and FAQs. I want a different size to your measurements? No problem we can adjust the length and width of the table tops and the steel leg frame to accommodate your requirements. The wood we use is from reclaimed timbers, normally reclaimed pine, which we source ourselves, are full of character, hard-wearing and warm. They are delivered as two pieces, the table top and the steel frame. This makes it easier to manoeuvre the table into its final location. Our delivery company will take care of attaching your table top to the steel frame for you. When will my Mac&Wood table be delivered? We work to a 6-8 week timeframe from receipt of order and initial 50% payment. Yes, we use a delivery company who will install your table into its final location. Delivery is not included in the prices listed and is quoted separately at time of enquiry. We will ensure you get the quality product you expect. You may cancel your order up to 7 days from paying the initial 50%. Once this time has passed we cannot offer any type of refund until you have paid in full and taken delivery of your order as these tables and benches are made to order. Once you have received your order you have 7 days to raise any issues you may have or to request a refund. How and when do I pay for my furniture? We require an initial 50% at the time of order and 50% prior to delivery. We can arrange delivery anywhere in the world. So far the furthest our tables have travelled is Texas. Please note: Reclaimed wood is a living and breathing item and will expand and contract based on its environment and the seasonal temperature. We ensure the wood is dried to within acceptable manufacturing standards, and moisture content, and our table top construction allows for a degree of movement in the tops. Further characterisation can occur over time and, in our mind this is part of the beauty of using reclaimed wood in our furniture designs. Colours do vary and may not match to the photos on this website. Sizes relating to the table itself mentioned on this website have a degree of variance and may not be spot on exact. Please treat this website as a guide to the final table we provide. After manufacture we seal all finishes with a wax polish which cleans and protects and produces a bright appearance in one operation, it is called Sheila Shine. This polish may also be used to maintain a bright appearance after installation or alternatively any good furniture polish including bees wax. Silicone free. This finish does not however protect the tops from marks and part of owning a Copper or Zinc top is the expectation for the tops to change, mark and patina over time and use. Pools of water or other spillages that dwell on the surface, will create marks and these tops will start to develop a patina quickly upon use. Any acids in food and drinks will create a patina as will scuffs etc from glasses, plates etc. The patina will continue to develop and blend over time. On no account should any acidic or alkaline cleaners be used, scourers or other abrasive product must not to be used and any spills must be removed quickly with warm soapy water and a soft cloth then dried, Sheila Shine polish may be reapplied if required. You should not set down hot plates without using a trivet or place mat and use coasters for all drinking glasses, ensure any decorative ornament placed on the table has a protective backing so as to protect the top. Only use warm soapy water to clean, never use any chemical products or scourers. Test any anti bacterial sprays on a small area to check for compatibility before use and finally, beware of use in direct sunlight the tops can become extremely hot. We create tables that reflect your personal tastes. How? By using a consultative approach that makes you a part of the design process, right from the start. To begin with, you’ll receive a scaled plan of your table for you to approve before we begin production. That gives you the chance to check the design and ensure it’s in-line with your vision. If you’re looking for larger dining chairs, that’s not a problem – just tell us the size you require and we’ll incorporate them into your plan. We’ll even adjust the legs to make sure your guests are comfortable when they’re sitting at your table. 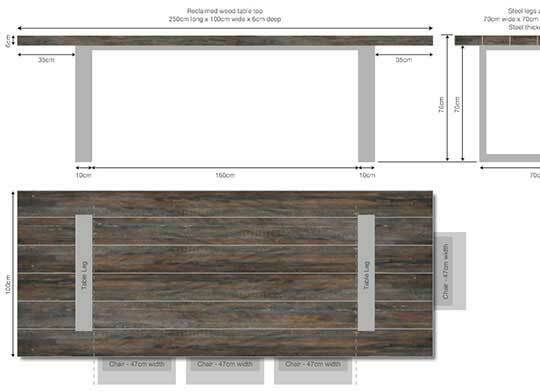 Need a bespoke size to suit a specific space? We’re on hand to create a tailor-made table for you.